A loop departing from the 76th Avenue trailhead heads to the north end of Upper Macatawa Natural Area, along the way sidling the Macatawa River. You pass beneath a power line four times along this 1.75-mile hike and the scenery is not nearly as interesting as the84th Avenue Loop. But the terrain is level and the walking easy. A loop departing from the 76th Avenue trailhead heads to the north end of Upper Macatawa Natural Area, along the way sidling the Macatawa River. You pass beneath a power line four times along this 1.75-mile hike and the scenery is not nearly as interesting as the 84th Avenue Loop. But the terrain is level and the walking easy. From the parking area a paved trail leads south 100 yards to a bridge across Dutchman’s Creek and post No. 5 on the other side. Head west (right) and a mowed lane will skirt the small stream and pass underneath the power lines. At Mile 0.3 you use a bridge to cross Macatawa River to post No. 3 and then head north (right) to follow the river for the next half mile and walk beneath the power lines a second time. Most of the year the Upper Macatawa River is more a drainage ditch than a river. Just before Mile 1 the trail reaches post No. 4 near Byron Road and then swings west along a stretch where it is easy to lose the trail. Eventually you reach the base of the ridge that encloses the Upper Macatawa floodplain and head south to return to post No. 3, reached at Mile 1.5. 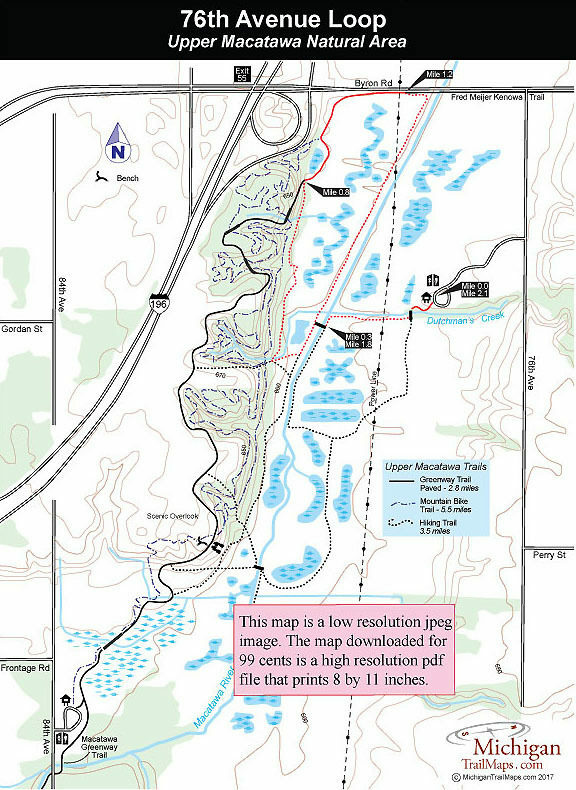 Re-cross Macatawa River to return to the 74th Avenue trailhead or continue south to add the 84th Avenue Loop and turn this hike into a 4.3-mile outing.